Back in November of 2008 we first informed our readers about Canadian Marcelo da Luz and his registered-in-Barbados solar car. For background, you can read our article Barbados Solar Powered Auto Breaks World Record For Distance. Mr. da Luz is now heading back to the Arctic Circle from New Orleans where he had a bad experience that left him about ten thousand dollars poorer after a thief broke into his support van and stole wallets, cash, cameras and electronics. According to reports, Mr. da Luz is still upbeat and has started his long drive back to the Arctic. We wish him good luck and lots of sunshine. Barbados Registered Vehicle In The Snow! Well… It Is REGISTERED In Barbados. That Makes It Ours, Right? 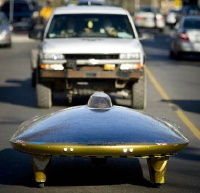 By a strange turn of international law, the world distance record for solar powered vehicles now belongs to Barbados. A Canadian – an Air Canada flight attendant named Marcelo da Luz – set the world record for distance traveled in a sun-powered car. He broke the current record of 15,070 kilometers (9364 miles) on October 30, 2008 in Victoria on Canada’s Pacific coast. To break the record, da Luz traveled for three months starting in Toronto, Ontario Canada and motoring (humming?) through New York State, Ohio, Indiana, Illinois, Wisconsin, Montana, Manitoba Canada, Saskatchewan Canada, Alberta, Yukon Canada past the Arctic Circle to Inuvik NorthWest Territory, Yukon and Alaska. How Does Barbados Come Into This? Mr. da Luz is a Canadian. 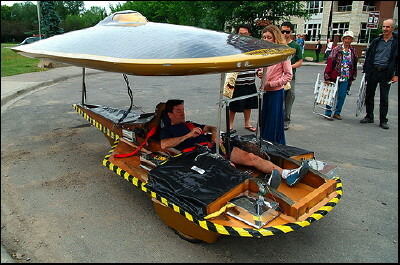 His solar-powered vehicle “Xof1” was built in Canada and his journey was conducted entirely in Canada and the United States. But his vehicle is registered in Barbados. The Ontario Province authorities would not register a solar-powered vehicle and allow it to travel on the public roads, so Mr. da Luz took advantage of a wee bit of international law that basically says if a vehicle is registered in one country, other countries must allow it on their roads even if it doesn’t meet their vehicle standards. As you may already have learned from the project website “news update”. XOF1 is now licensed and registered as a regular vehicle in Barbados. 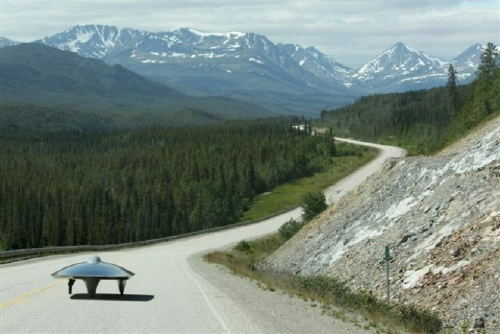 The past two years I tried to work with various Canadian governments (Ontario, Northwest Territories, Alberta, etc…) to get the proper permission to drive the solar car on public roads without any success. The project (car and driver) moved to Barbados got licensed and registered, it can now be driven on public roads not only in Barbados but in most countries including Canada protected by the 1949 International Traffic Treaty that overrules local laws. Interesting enough, regular vehicles are not inspected in Barbados. However, due to XOF1’s high profile it got inspected. In fact, the licensing chief officer demanded all inspectors to check the solar car before allowing it to be licensed. After some modifications done to the vehicle it got approved.